Five donut shops, five hours, three cities, and who knows how many calories — I’m calling it the The Charlotte Donut Tour. The Charlotte Donut Tour, like all great stories, begins with bitterness. Our buddies Johnathan and Abbi O’Donnell had recently started a donut pop-up called Doughtown Gourmet. The Blackberry Goat had me convinced that Doughtown truly was the G.O.A.T. when it came to Charlotte donuts. But if they are to unseat a pastry king, whose throne are they about to sit pretty on? 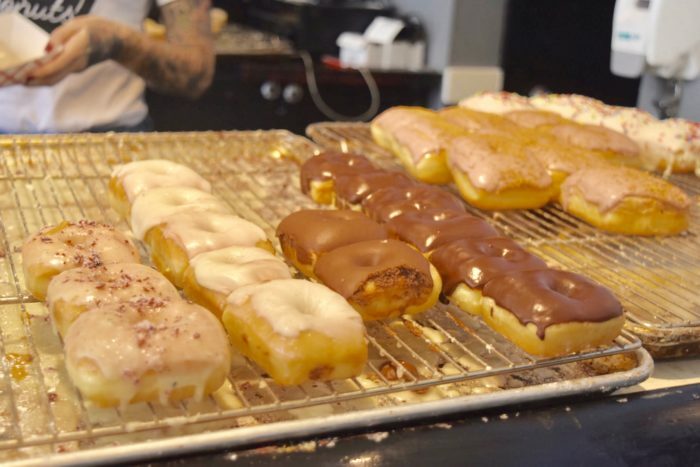 In simpler terms, what’s the best donut shop in Charlotte? We argued for awhile, but in the end decided to put our donuts where our mouth is. Via @doughtowngourmet on Instagram. Grab some Saturday mornings at the farmer’s market behind Pure Pizza at 1911 Central Ave.
Obviously, it’s impossible to pick a “best” donut. But at the end of the day, we could at least say that our donut opinions were no longer, ugh, full of holes. 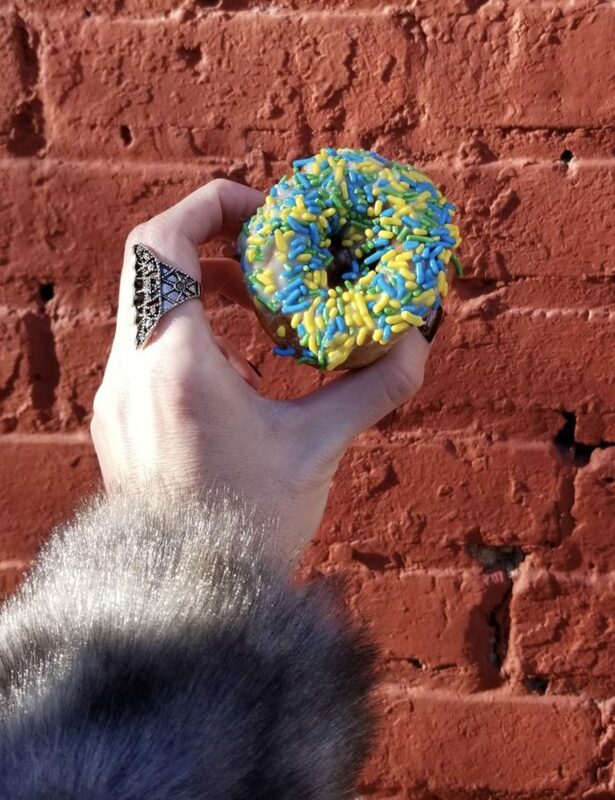 This day was colder than we expected, and NoDa’s walk-up donut shop Reigning Donuts was the perfect way to kick things off. 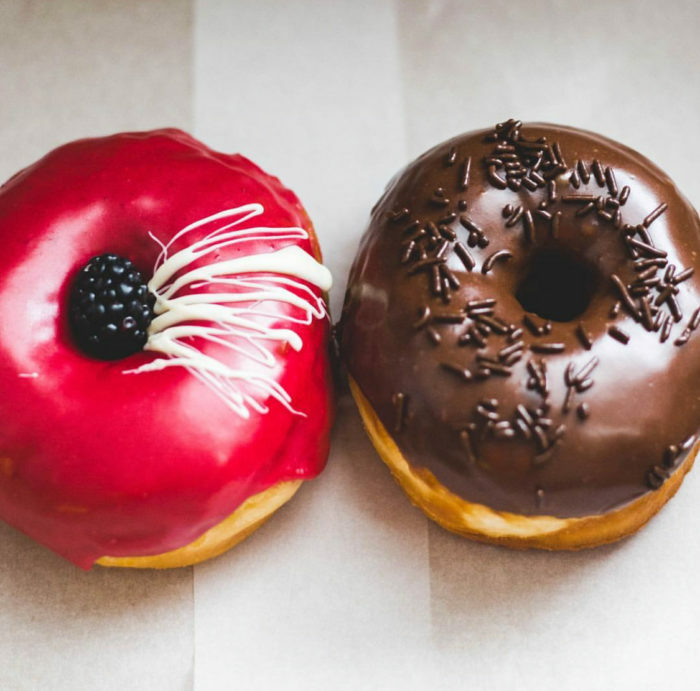 The price is excellent, but don’t expect a big donut – they’re definitely on the smaller side. They’re slightly larger than those mini donuts you can buy in a grocery store. Still, the bite-sized warmth, drippy icing, and satisfying crunch in the cake was perfect for a cold morning. Reigning Donuts at 3120 N Davidson St Ste 100. 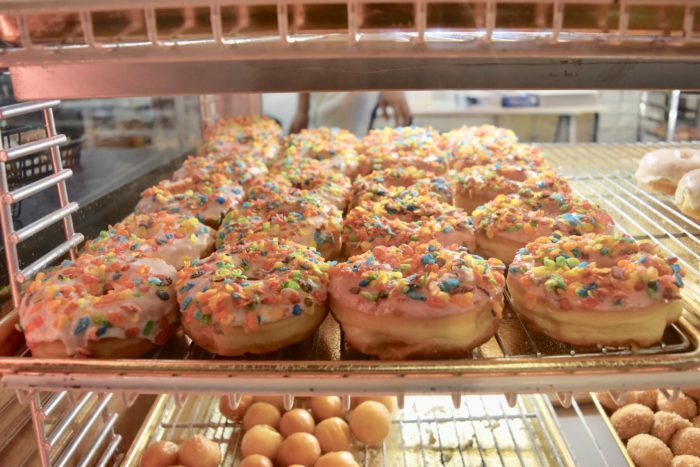 I’ll forgive OMG Donuts for being in Concord because their Fruity Pebbles Donut was out of this world. 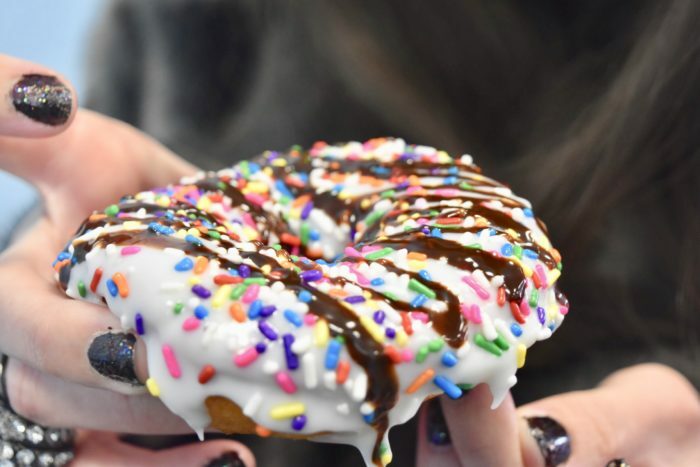 This stop was an early leader, with several folks in my crew saying the sweet icing and novel toppings reminded them of donut shops in their hometowns of Dallas, New York, and Philadelphia. “I feel like I’m finally tasting a real donut,” one said. This is also where many of us stopped pacing ourselves, forgetting we still had lots of donuts to eat. 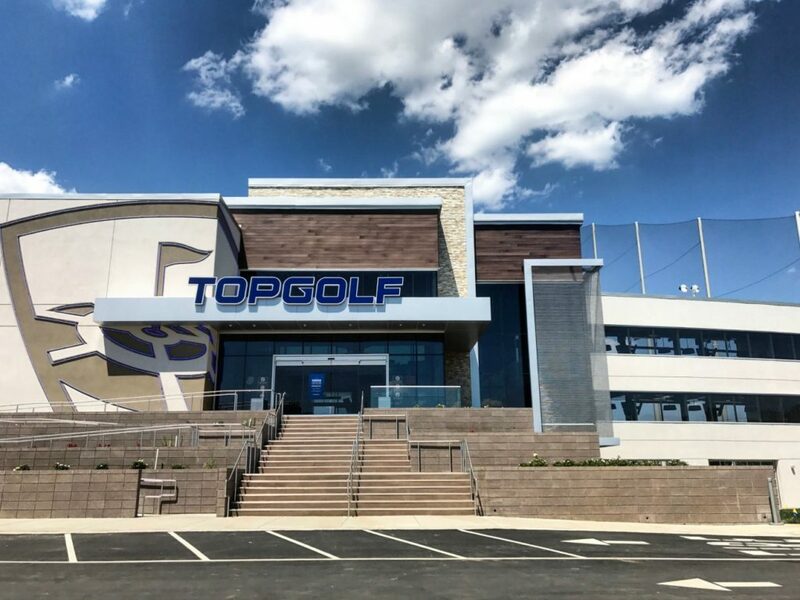 OMG serves up goodies at 10005 Weddington Rd Ext. in Concord. Your Mom’s Donuts was the most polarizing stop on the tour. Square donuts almost seem unholy. 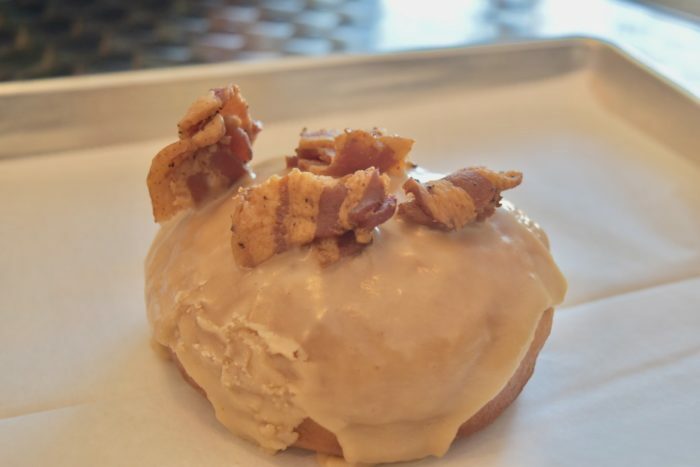 I tried the pimento cheese donut and loved it, but that’s because you could put pimento cheese on a shoe and I’d probably still eat it. It didn’t beat Reigning Donuts on price, or OMG on taste, but creativity, inventiveness, and the space itself were unmatched. Your Moms Donuts at 11025 Monroe Rd in Matthews. We got to Sugar later in the day when they literally had, like, two donuts left. Luckily, these puppies are huge and filling, so we split them. One person in our group thought Sugar was the winner for the day based on sheer bang for your buck. At the very least, their maple bacon could beat other shop’s maple bacon in a fight. 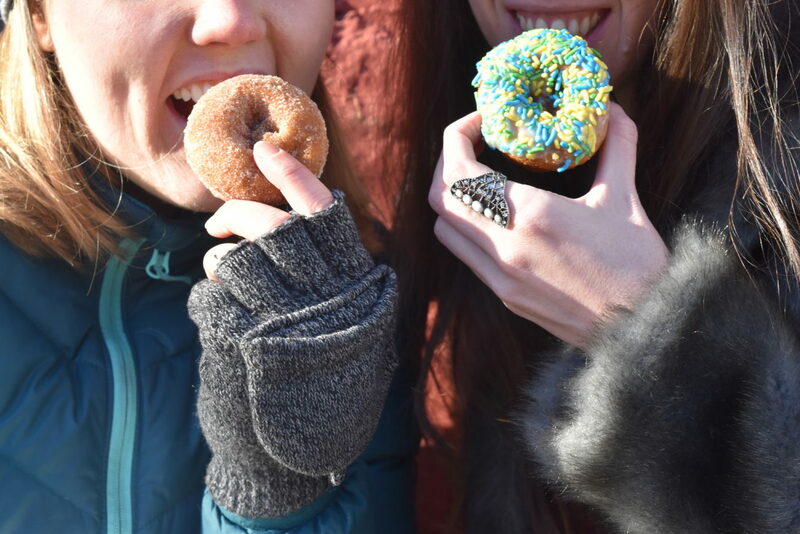 Also, by this point, we were pretty sure we’d never eat another donut again. Sugar is located at 11914 Elm Ln here in Charlotte. Duck Donuts had the perfect size, price, sweetness, warmth, and crunch. If I had to pick a best donut, it would be Duck Donuts. I never thought this shop would win. It’s just too popular. But I guess you don’t know what you’ve got ’till you’re stuffed with four of its competitors. The Duck duked it out and iced its rivals. Heavy drips the icing that wears the crown. Duck Donuts is at 1710 Kenilworth Ave #220 in Dilworth.